Our Teddy R Daybed, for style, comfort and utility, is unsurpassed. Put up a friend for the night or pile on the family for movie-time; the Teddy R Daybed is sitting pretty and always ready. 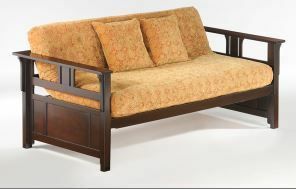 Our Daybed Collection is an all wood (or all wood & rattan) collection, from the arms & back panel to the bed platform. Built with the finest materials and constructed strong & smart, our Teddy R Daybed is a piece of furniture that will endure for years to come. All Daybed Collection items come with a limited 10 year warranty.